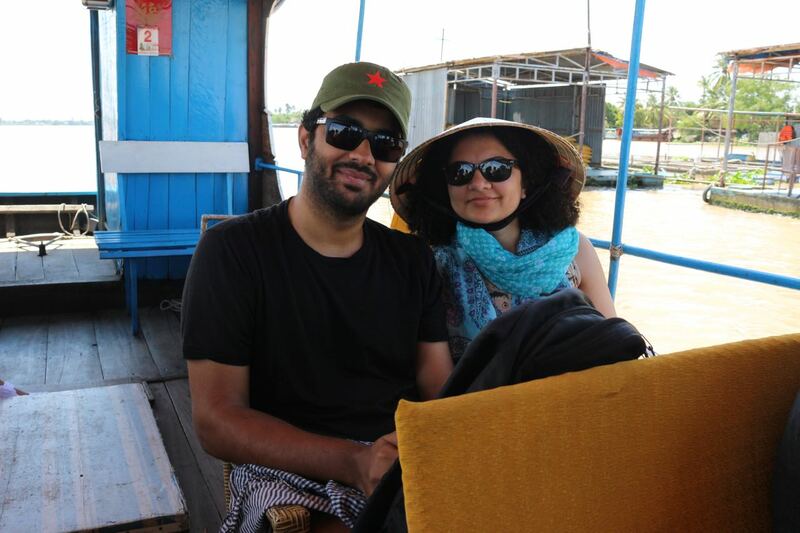 Shuchi and I had a great time in Cambodia - next, it was time for us to visit Vietnam. We planned to travel this country from south to north. We took a 6-hour bus from Phnom Penh to the capital of Vietnam Ho Chi Minh City(HCMC). HCMC is a big city full of high rises, malls, and shops all over the city center. 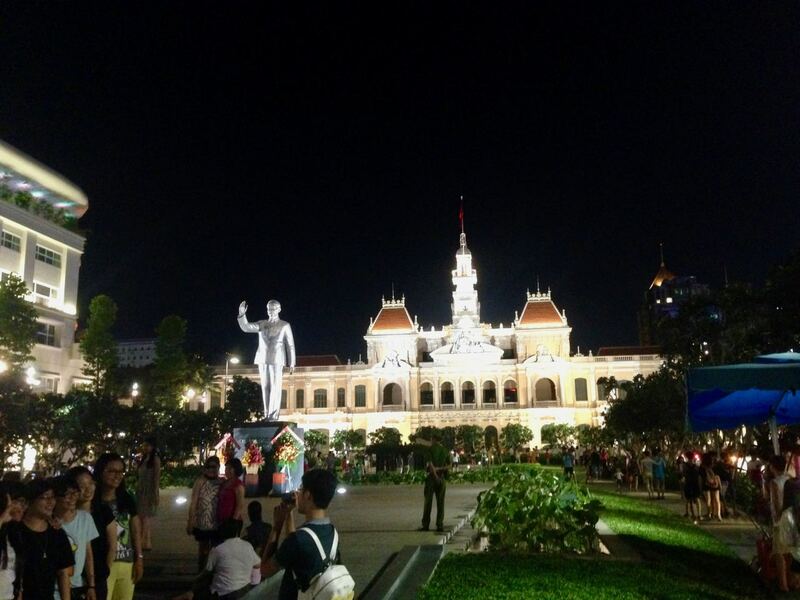 This city was earlier called Saigon but after the victory of Viet Cong, it was renamed after the leader Ho Chi Minh. So far we had just read about Vietnam War in books but after our visit, we understood it affected these people. After checking into our hotel we decided not to waste any time and headed straight to see the War Remnants museum. This place very vividly depicts the moments of war through pictures and remnants. It makes you depressed after learning about the atrocities that had happened during war time. 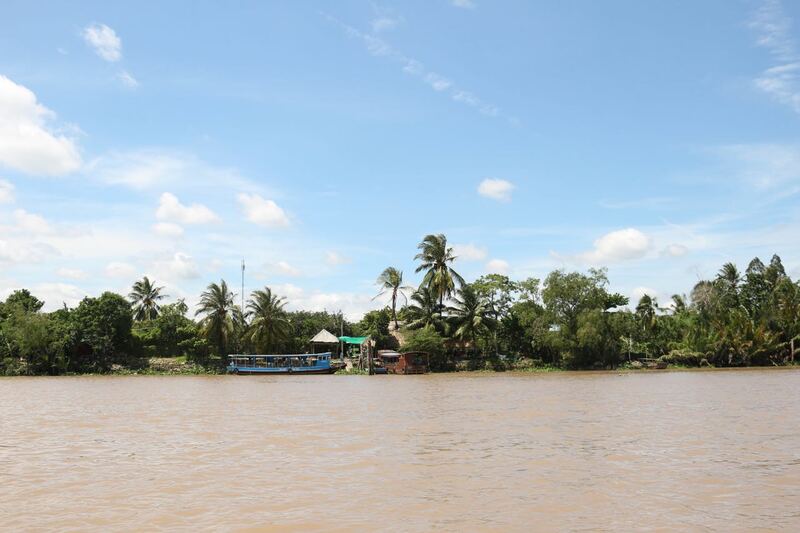 Next day we took a day tour to Mekong delta in the southwestern part of Vietnam where Mekong river merges into the sea through a network of distributaries. This is a very lush green area covered with rice fields all over the place. 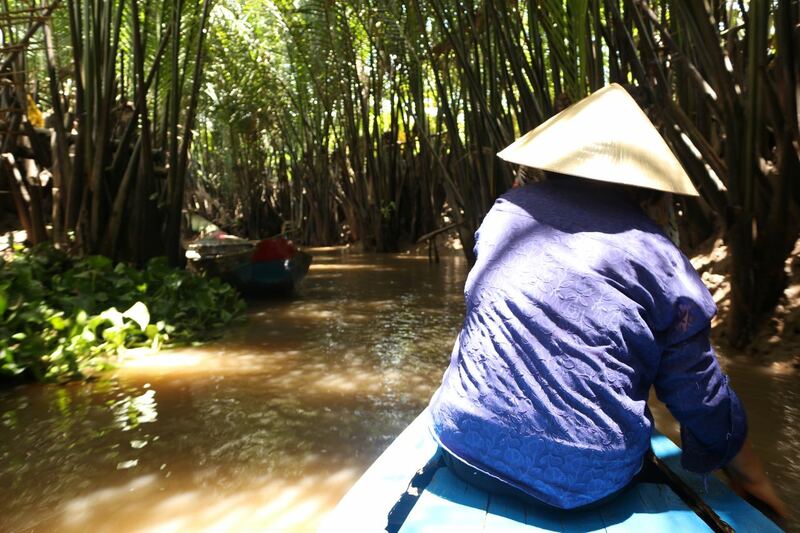 Mekong delta is around 3 hours drive from HCMC but in order to reach the interiors, one has to take the boat ride run by local people. The locals were playing music and making coconut candies. Later had fresh fish from Mekong river for lunch. This place was good but overall both Shuchi and I felt it was a bit overhyped as everything there seems very touristy. Next morning we took a short flight to the highlands of Da Lat. 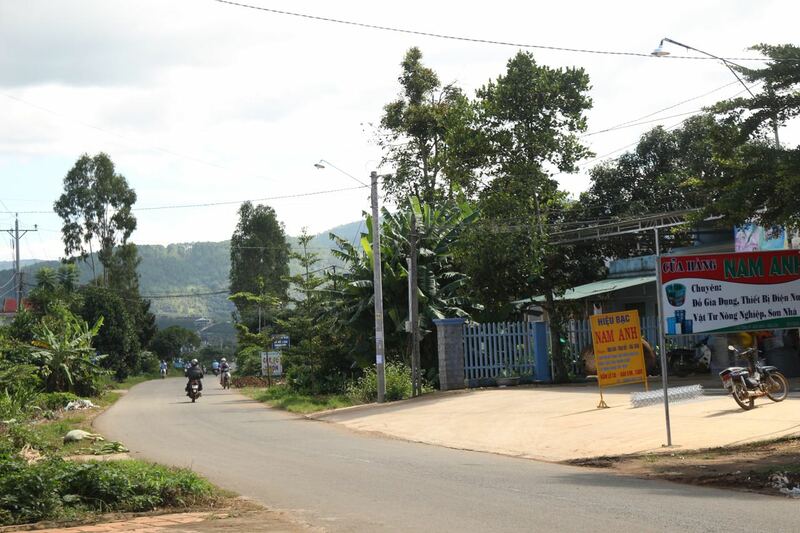 This place is a small hill station around 200 Km up north of HCMC. 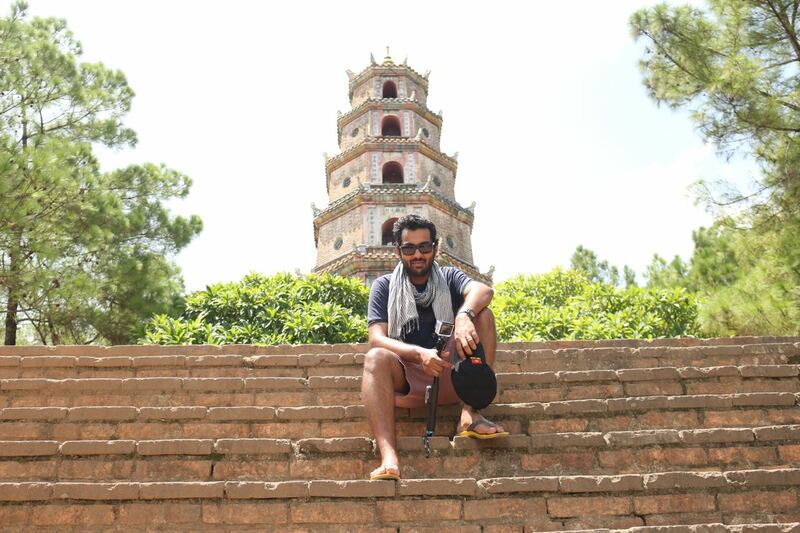 Da Lat was a great respite from the scorching hot and humid weather of HCMC. 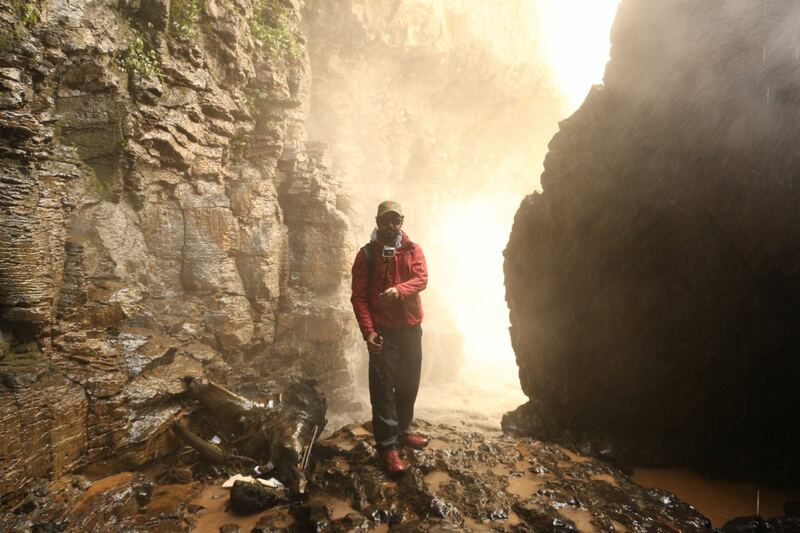 The temperature here was around 20-degree celsius with cold winds blowing through the day. We stayed at a small hotel called Pink Villa near the city.Shuchi and I were very interested in seeing the villages of Vietnam so next day we rented a motorbike to explore nearby areas of Da Lat. 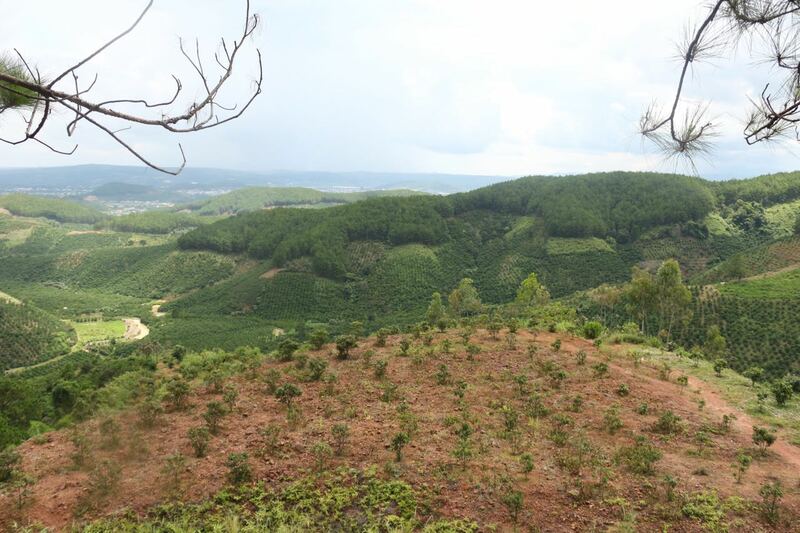 Highlands of Da Lat were lush green with coffee and mango plantations along the way. Next, we went to see the monastery(Trúc Lâm Temple) in Da Lat. This is a zen Buddhist temple located on top of a hill. The environment at the monastery was calm and serene. It's was an amazing moment to be there. 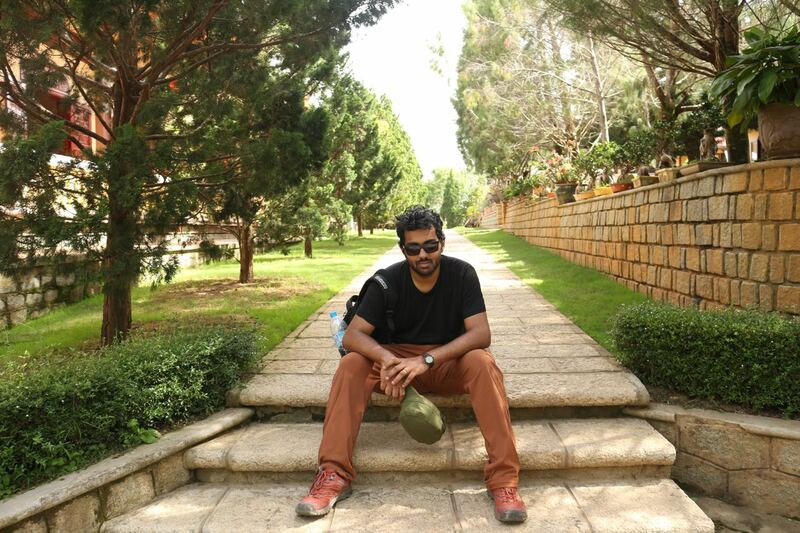 Views of hills and greenery all around were truly breathtaking. We spent one more night in Da Lat then took a bus to the beach town of Nha Trang. Nha Trang is around 140Kms from Da Lat. It took us around 3hours to reach there. Nha Trang was a big tourist beach town with lavish resorts all around the place. We were surprised to see the number of Russian tourists in this area. 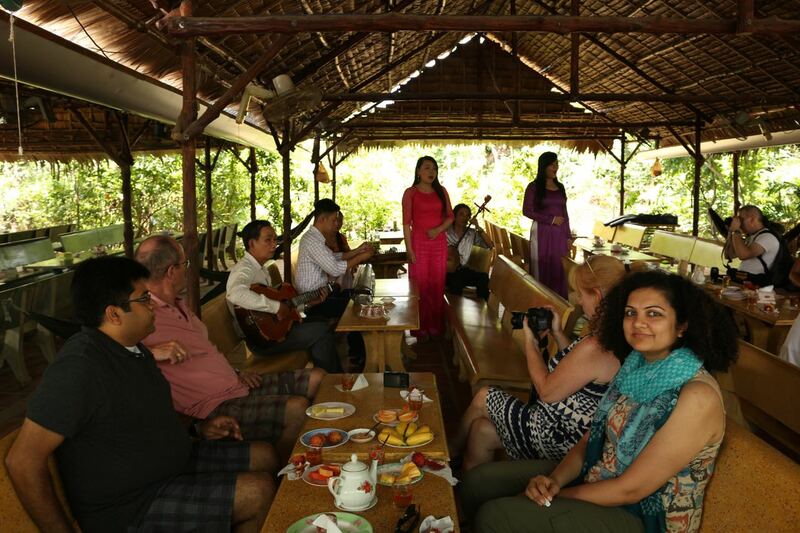 As told by the locals, for last few years Nha Trang was one of the primary tourist destination for the Russians - they even have a special charter flight and very affordable tour packages for Russians. A lot of locals spoke Russian here, restaurant menus, shops everywhere were all written in Cyrillic letters. Beaches in Nha Trang were nice, clean and warm but they were too crowded for our taste. It was hot most of the time in August, around ~40-degree celsius so we spent a lot of day time inside our hotel. 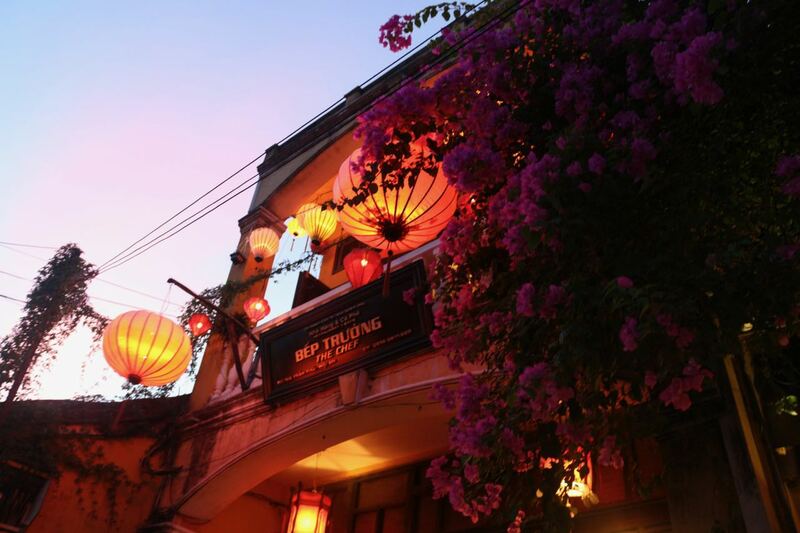 After Nha Trang, we decided to travel further up north in Central Vietnam to the historic old town of Hoi An. 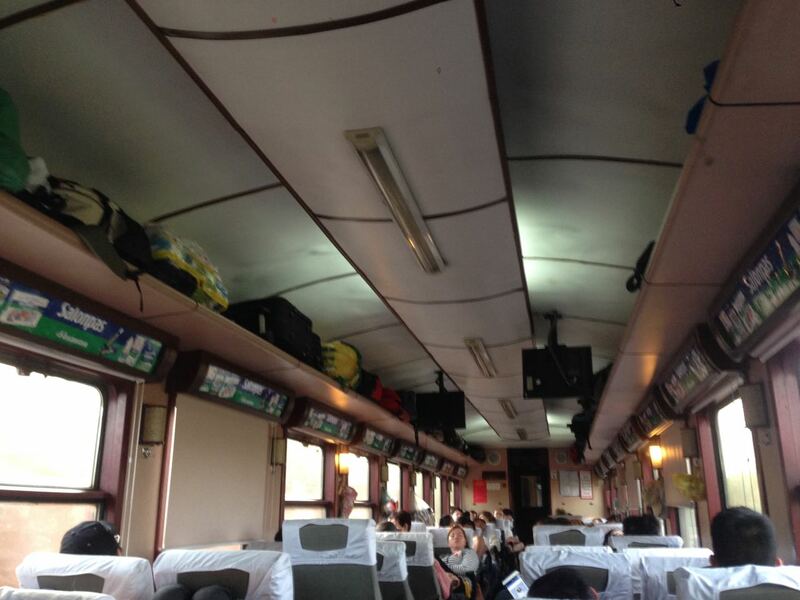 It was a 10hour long train ride from Nha Trang to Da Nang - the closest train station to Hoi An. We didn't get a soft bed sleeper seat in the train so spent entire 10-hour overnight journey in a sitting coach. We were initially very apprehensive about this but it was not that bad. Seats had good cushion, ample leg space and a good recline to sleep overnight. We reached Da Nang around 10 am and then took a cab to Hoi An - it was an hour long 40 Km scenic drive along the beach. 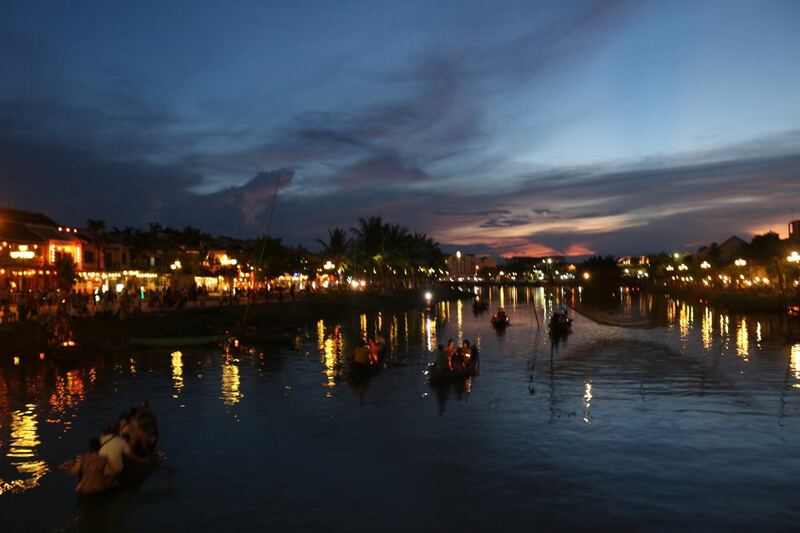 Hoi An is an ancient town listed as a Unesco world heritage site. Beaches in Hoi An were far less crowded and cleaner than Nha Trang. 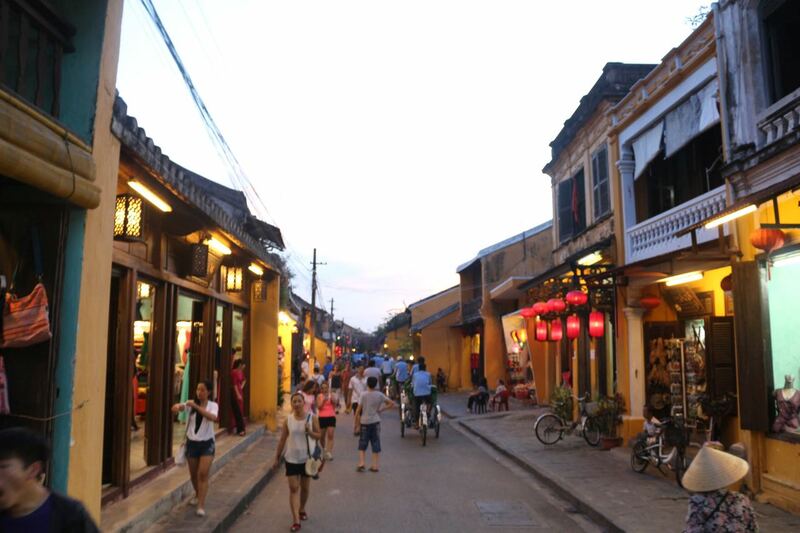 August in central Vietnam is very hot with no sign of rains so we visited the old town in evening. The streets and houses in town were inspired from French Rennaissance kind of architecture. This place was full of tourists and restaurants all over the place. 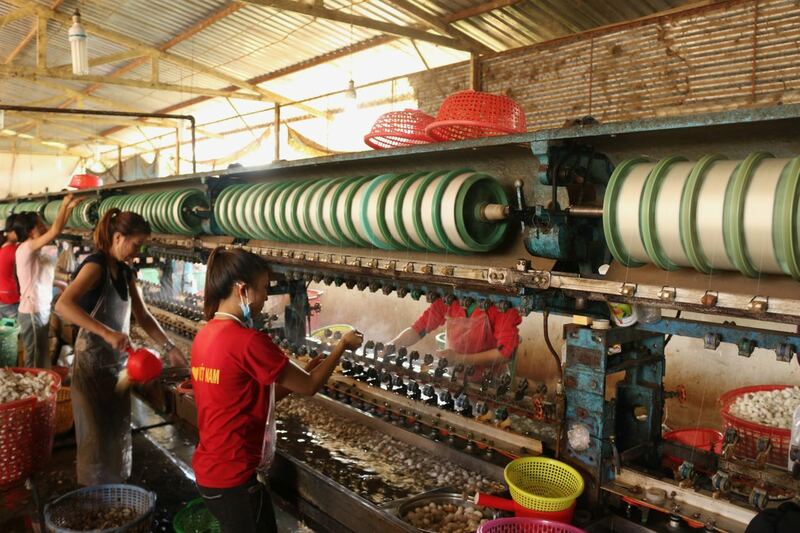 Hoi An is famous for custom made suits and shoes. 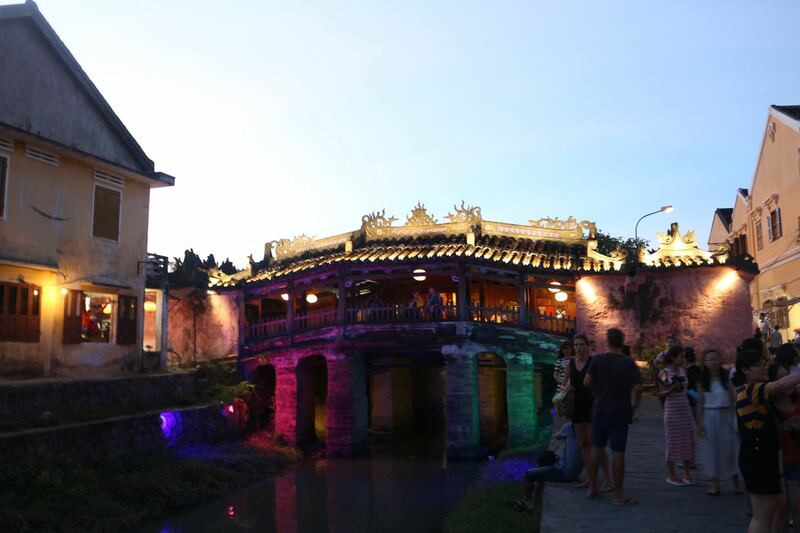 We spent a couple of days in this quiet old town then traveled up further north to the city of Hue. 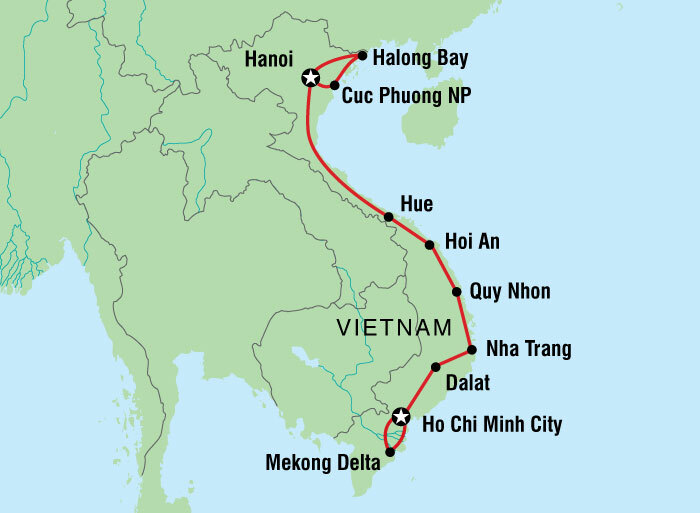 Traveling further north for 3 hours by train from Da Nang we reached Hue. 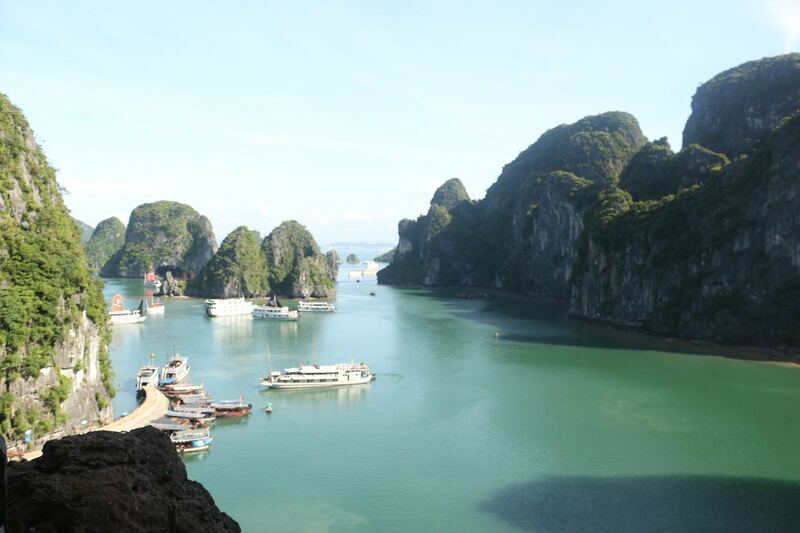 We highly recommend taking a train to reach Hue as its full of tunnels and beaches. 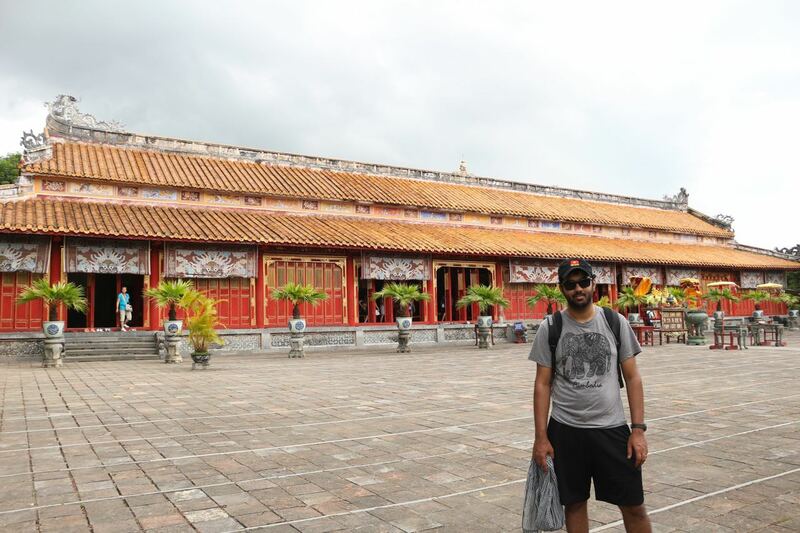 We reached Hue in afternoon and the temperature was about 45-degree celsius. 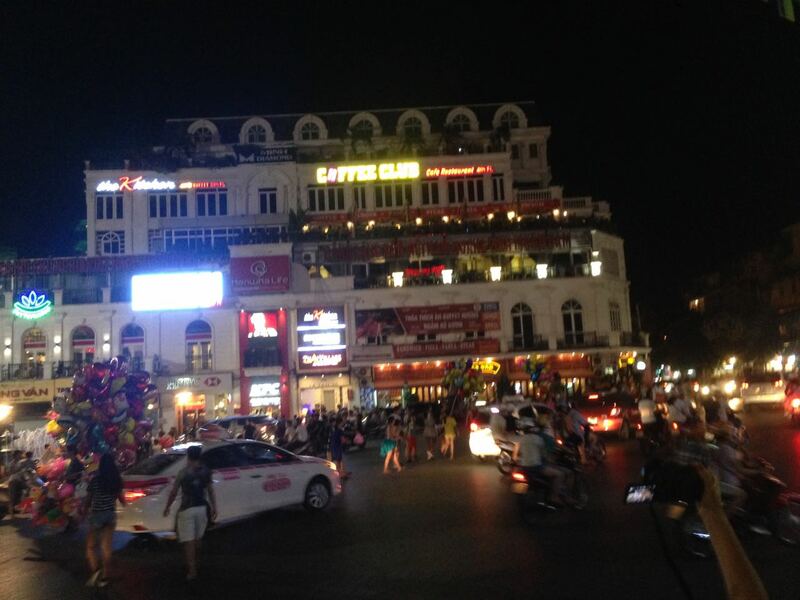 We took a cab to our hostel and spend our first evening exploring the city area. 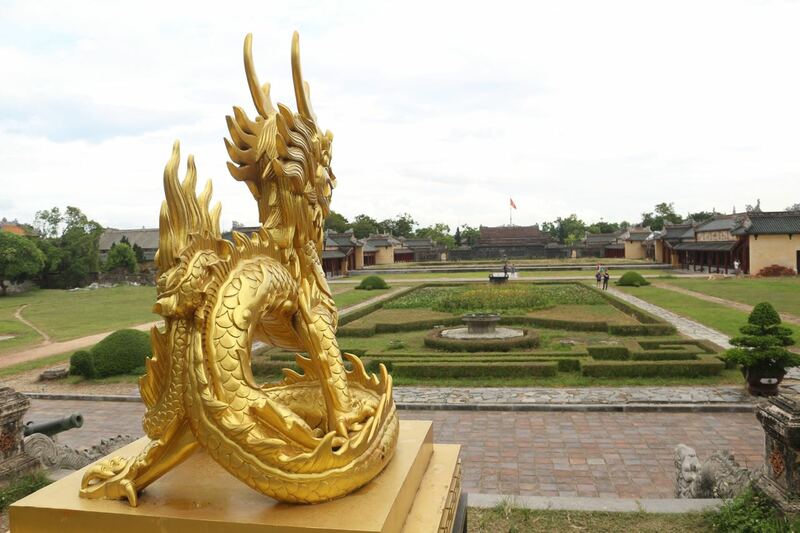 Hue is Vietnam's former Royal Capital and full of citadels, pagodas, and tombs that attract tourists globally. Shuchi and I rented a scooter from our hostel and started exploring this historical city. The imprerial city was a short ride from our hostel. 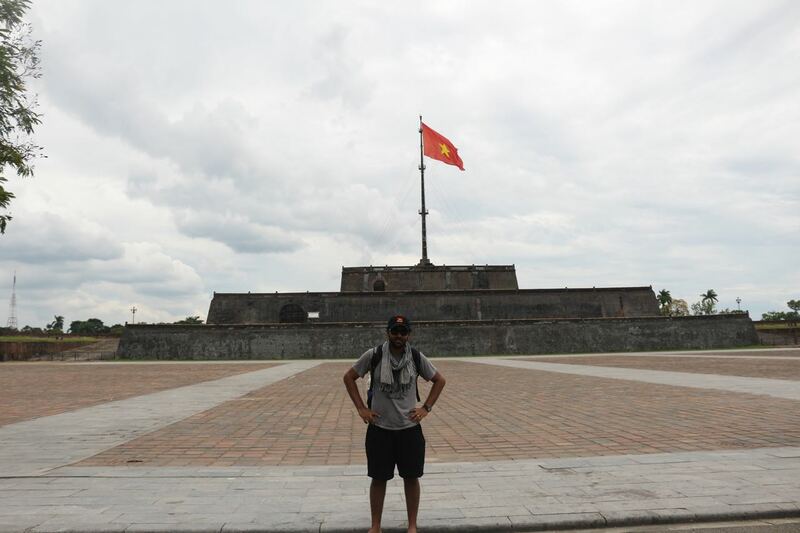 After passing through huge walls of citadel surrounded by the water of Perfume river we reached Cửa Đông Nam (Southeast Gate). 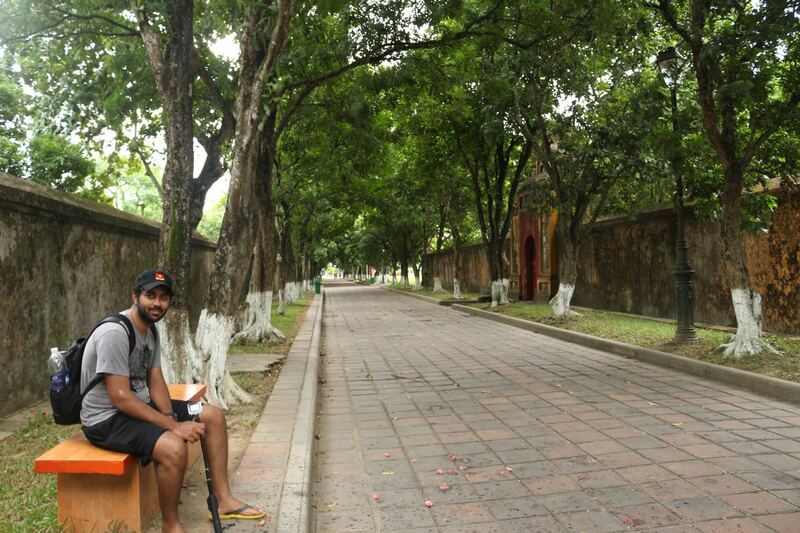 The entire city was lush green full of historical monuments. It takes almost 1 complete day to visit all the places of this 3Km long city. 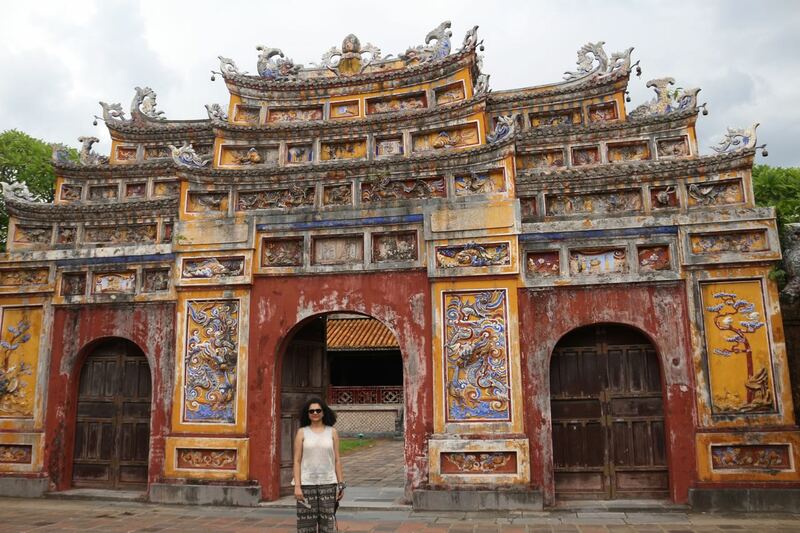 We visited the Tu Cam Thanh (Forbidden Purple City), Dai Noi (Inner city) and Tran Binh Dai, which exclusively had ancient architecture. Next morning we visited Thi Muin Pagoda. 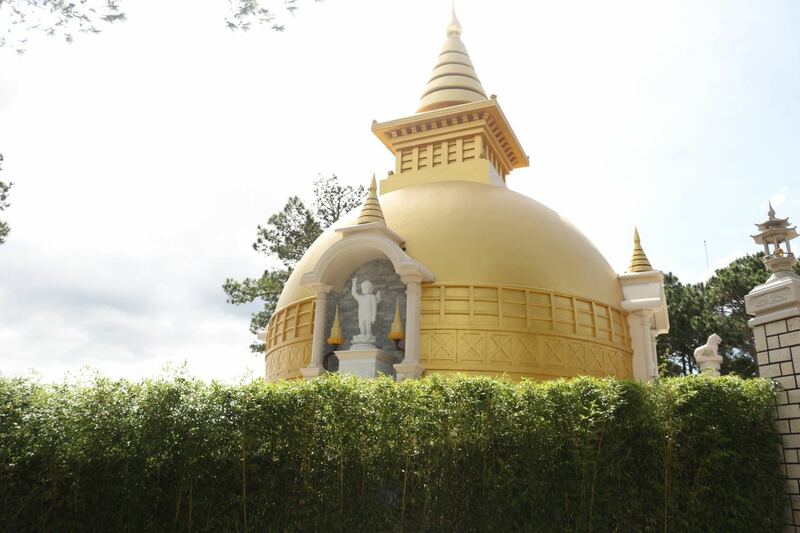 It was a 21 meters long octagonal tower surrounded by lush green trees and temple complex. 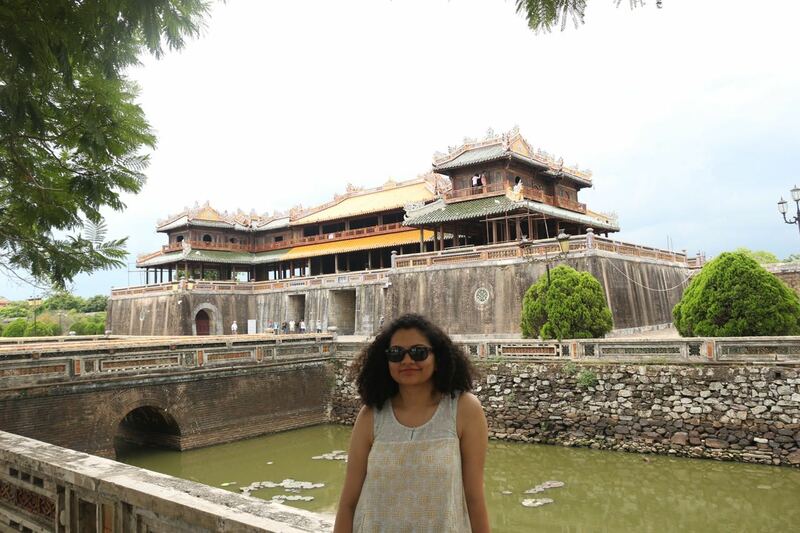 Later, we visited the tombs of various rulers of Nguyen dynasty. 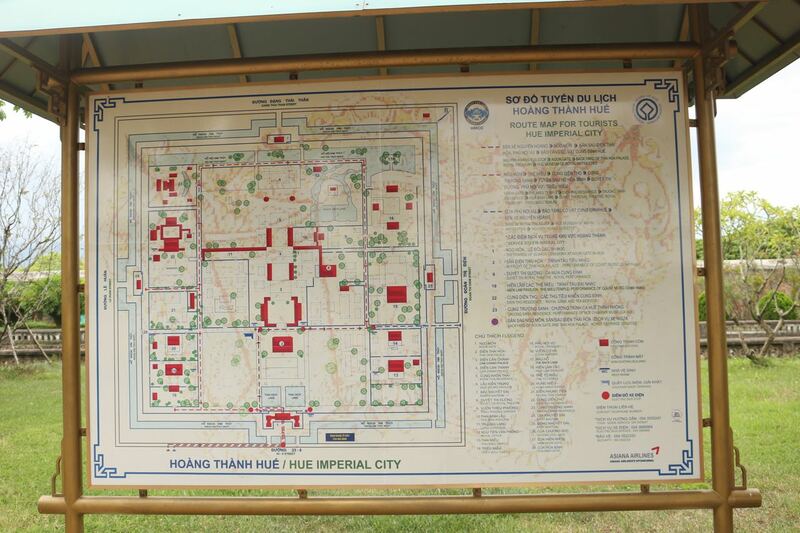 Both Shuchi and I thought tomb complex was ok but one should visit it if they have time. 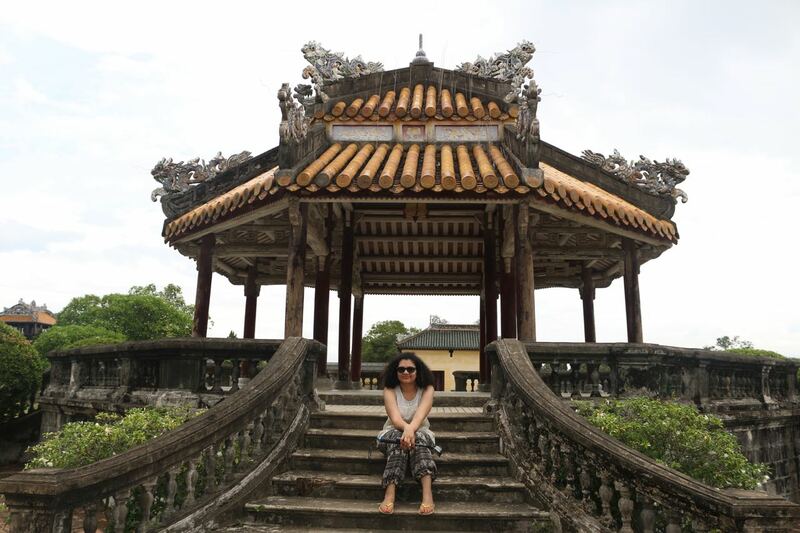 From Hue, we had a flight to Hanoi; our next and final destination in Vietnam. We reached Hanoi airport at around noon. 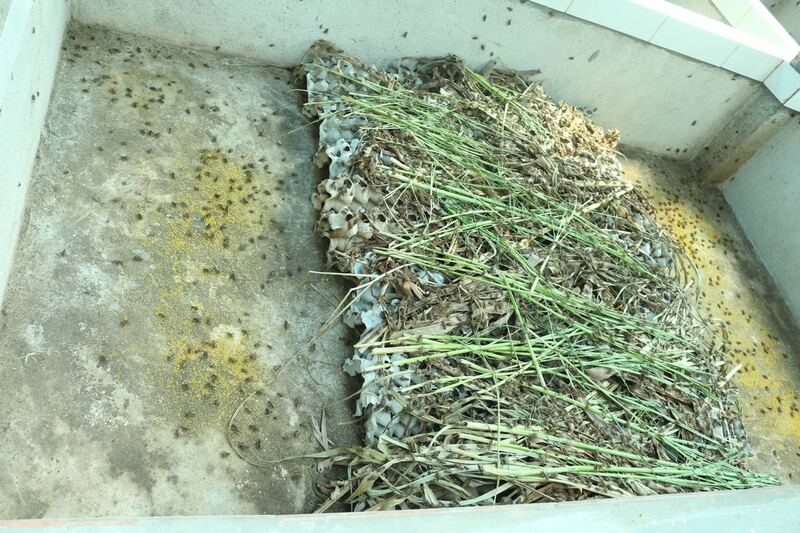 It was a short one hour flight from Hue. We chose of stay in the old quarter area which is close to all major attractions. 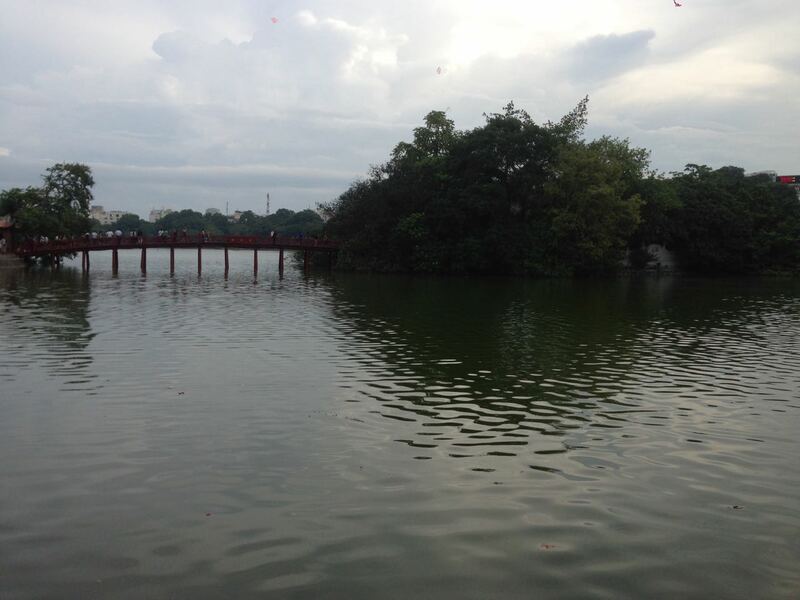 A short walk from our hotel was Hoàn Kiếm Lake which is the central spot of city full of public life. We spent a lot of time walking around the lake and city area. This place is bustling with shops and restaurants all over the place. 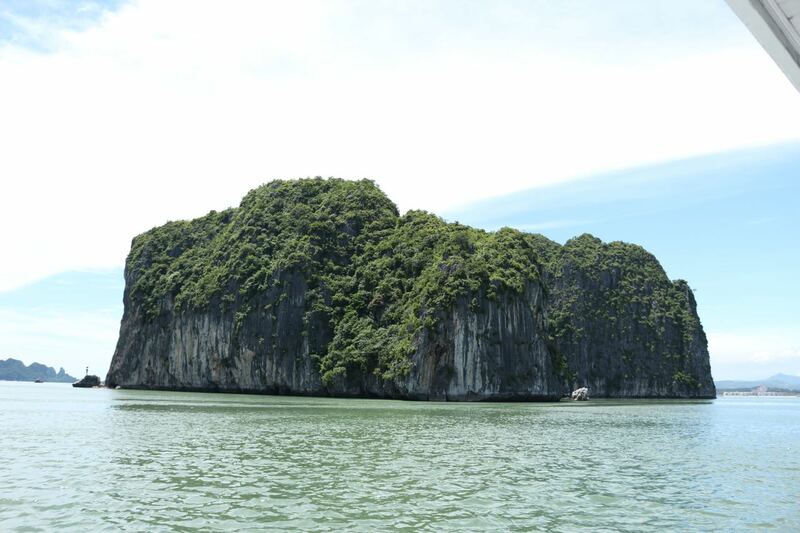 We spent two days exploring the city area before taking a Halong Bay cruise. Our cruise company picked us from our hotel and it was a 3-hour drive to reach the port from where the cruise starts. It was all worth the wait - the majestic huge limestone rocks were amazing and views were truly mesmerizing as we were cruising through this lovely green bay. 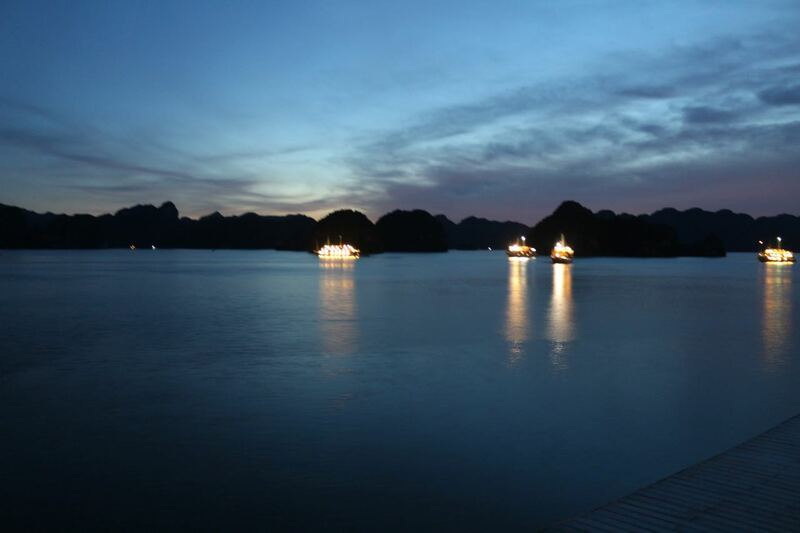 We spent a night on cruise in the middle of Halong Bay and returned to Hanoi next morning. 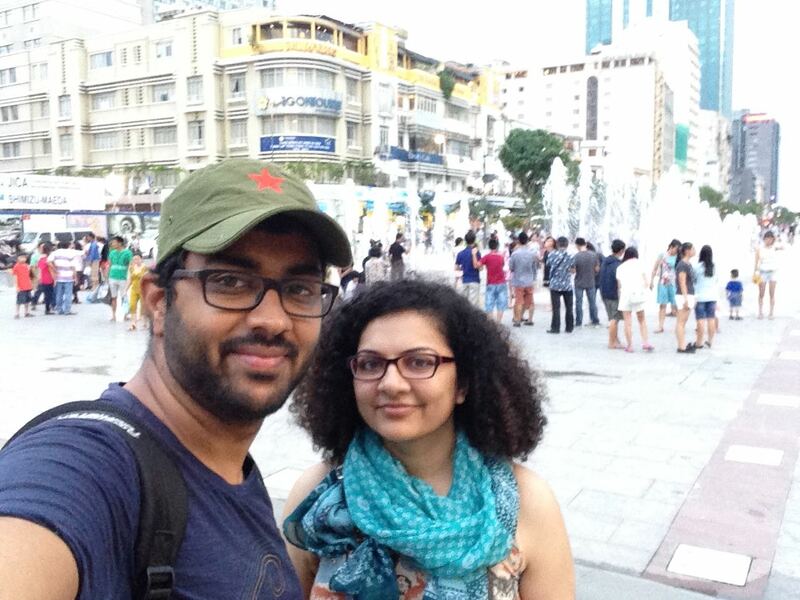 After returning from Halong Bay we spent a couple of more nights in Hanoi and finally took a flight back to India. 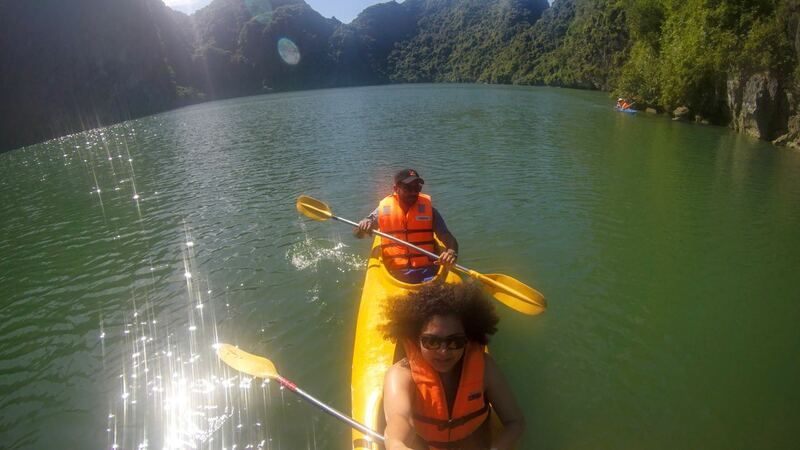 It was an amazing one month we spent in Vietnam traveling from South to North. 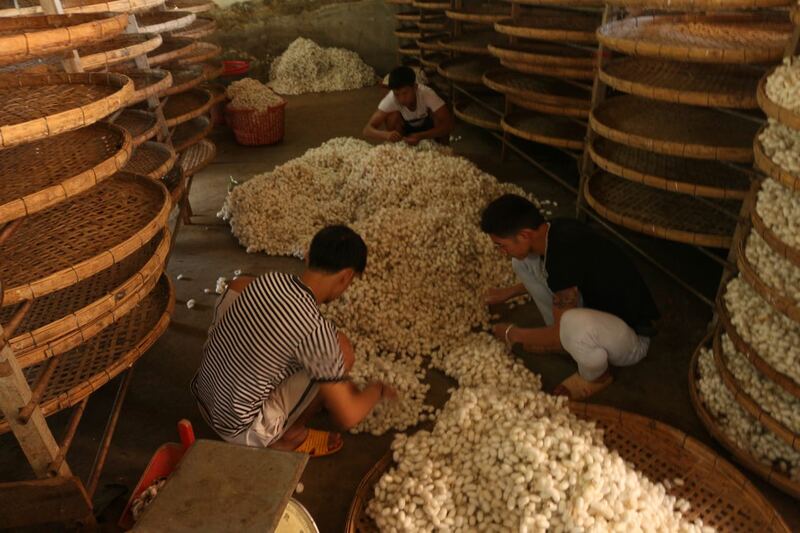 We learned so many things about Vietnam/American war, Vietnamese cuisine and their culture. It was truly a trip that Shuchi and I will remember for rest of our lives.